Eastbound E 53rd Street is closed to through traffic at Avenue E (Toll Plaza) effective 11/09/15. Drivers wishing to access the Toll Plaza must go down another eastbound street to Avenue E (51st, 49th, etc.) Access to local businesses (QuickChek, Value City, etc.) on E 53rd Street is maintained. Westbound 53rd Street from the Toll Plaza to Broadway will not change. The Eastbound closure is expected to be in place for six (6) months. This is a major traffic change. Traffic from the Toll Plaza to Port Jersey Boulevard and Route 440 has been shifted left (east), onto the existing (one-way) bridge in a two-way pattern. This is a major traffic shift. PLEASE CLICK HERE TO SEE THE FULL PAMPHLET AND DETAILS. Retaining wall construction along Frontage Road continues. This work will be supported by Jersey City and Bayonne Police as needed. During the evening of 12/03/15, Garfield Avenue will be reduced to a single lane with alternating traffic to allow for new bridge work. This work will also be supported by Jersey City and Bayonne Police as needed. Water main work on E52nd Street between Avenue E and Broadway and on Avenue E between E50th Street and E52nd Street will continue. Daily closures, 8:00AM to 3:30PM, of E52nd Street and detours of Avenue E are expected. This work will be supported by Bayonne Police. Northbound Avenue E traffic has been shifted to a new alignment, east of the Connector Bridge, between E50th Street and the Toll Plaza. The left turn at 53rdStreet is no longer available. Traffic from Port Jersey Boulevard to the Turnpike cannot make a right turn onto the service road at 53rd Street. THIS IS A MAJOR TRAFFIC SHIFT. CLICK HERE FOR PAMPHLET. Bridge demolition work will continue. Daily closures of E52nd Street are expected to continue through the week of 12/14/15. This work will be supported by Bayonne Police. Ground improvement work in advance of new ramp construction continues. Beginning 11/20/2015, no weekend long closures are currently scheduled for the mainline Newark Bay Hudson County Extension for the remainder of 2015. Motorists can call 511 from any phone (Listen for the initial voice prompt and ask for traffic conditions. Motorists can ask for a specific Highway, City, or even a point of interest. Residents of Newark / Essex County and Kearny / Hudson County can monitor traffic conditions by accessing Turnpike webcams at http://www.state.nj.us/turnpike/cameras-and-signs.html, and http://www.511nj.org/cameras.aspx. Take the New Jersey Turnpike/I-95 to Exit 14A – Bayonne. Stay left approaching the Toll Plaza. Follow directions below. After you come through the Toll Plaza, stay left and follow the signs for Route 440 South. Proceed 1 1/2 miles and make a left into the Bayonne Ocean Terminal. The cruise terminal is two miles straight ahead. Follow Avenue E Southbound to East 40th Street and turn left. Then turn right onto Chosin Few Way. Then go left onto Goldsborough Drive. Take East 53rd Street to Broadway. Take Broadway South to East 30th Street, turn left. Take East 30th Street to the end and go left onto Route 440 North. Go right onto Port Terminal Boulevard, which becomes Goldsborough Drive. Take Broadway South to East 30th Street, turn left. Take East 30th Street to the end and go left onto Route 440 North. Go right onto Port Terminal Boulevard, which becomes Goldsborough Drive. Eastbound E 53rd Street is closed to through traffic at Avenue E (Toll Plaza) effective 11/09/15. Drivers wishing to access the Toll Plaza must go down another eastbound street to Avenue E (51st, 49th, etc.) Access to local businesses (QuickChek & Value City) on E 53rd Street is maintained. Westbound 53rd Street from the Toll Plaza to Broadway will not change. The Eastbound closure is expected to be in place for six (6) months. This is a major traffic change. Daily daytime lane closures on JFK Boulevard are expected to continue through the week of 11/16/15. This work will also be supported by Bayonne Police. Bridge demolition work will continue. Daily closures of E51st Street at Avenue E are expected 11/11/15 through 11/17/15. Daily closures of E52nd Street are expected beginning the week of 11/16/15. This work will be supported by Bayonne Police. 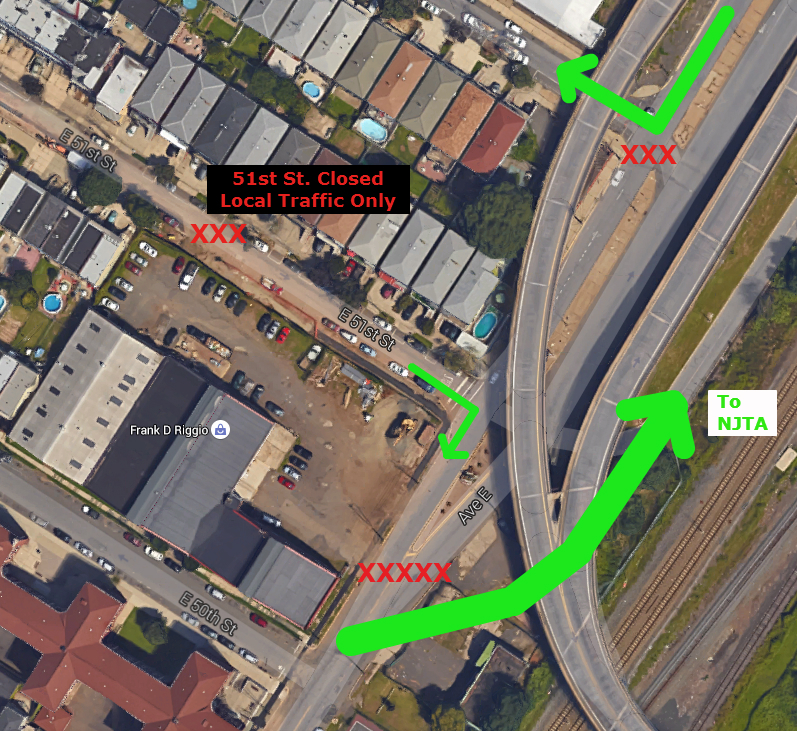 Bridge demolition work will occur at 51st Street and Avenue E from 8:00PM Friday, 11/13/15 to 6:00PM Sunday, 11/15/15. During this period, Northbound Avenue E traffic will be maintained on a temporary alignment between E50th Street and E51st Street and Southbound Avenue E traffic will be diverted to E52nd Street. E51st Street will be closed to through traffic and local residents will be able to exit onto Avenue E southbound only. Individual (single) Toll Lanes will be closed nightly, 8:00PM to 5:00AM M-F, will continue through the week of 11/16/15. Eastbound E 53rd Street is closed to through traffic at Avenue E (Toll Plaza) effective 11/09/15. Drivers wishing to access the Toll Plaza must go down another eastbound street to Avenue E (49th, 51st, etc.) Access to local businesses on E 53rd Street is maintained. Westbound 53rd Street from the Toll Plaza to Broadway will not change. The Eastbound closure is expected to be in place for six (6) months. This is a major traffic change. Daily daytime lane closures on JFK Boulevard are expected the week of 11/09/15. This work will also be supported by Bayonne Police. Ramp from westbound HCE to Toll Plaza will be shifted onto new pavement and a new median work zone were created the week of 11/02/15. Bridge demolition work will begin the week of 11/09/15. Daily closures of E51st Street at Avenue E are expected 11/11/15 through 11/17/15. Daily closures of E52nd Street are expected beginning the week of 11/16/15. This work will be supported by Bayonne Police. Individual (single) Toll Lanes will be closed nightly, 8:00PM to 5:00AM M-F, will continue through the week of 11/02/15. Eastbound 53rd Street will be closed at Avenue E (Toll Plaza) at midnight on 11/06/15. Access to local business will be maintained. Westbound 53rd Street from the Toll Plaza will not change. The Eastbound closure is expected to be in place for six (6) months. This is a major traffic change. Traffic from the Toll Plaza to Port Jersey Boulevard and Route 440 will be shifted left (east), onto the existing (one-way) bridge in a two-way pattern during the weekend of 11/06/15 – 11/08/15. This is a major traffic shift. On 11/04-11/05/15, between 8:00AM and 4:30PM, JFK Boulevard will be reduced to one lane of traffic in the northbound and one lane of traffic in the southbound direction for steel beam erection. This work will also be supported by Jersey City and Bayonne Police as needed. Ramp from westbound HCE to Toll Plaza will be shifted onto new pavement and a new median work zone created the weekend of 11/06/15. Water main work on E52nd Street between Avenue E and Broadway and on Avenue E between E50th Street and E52nd Street will continue. Daily closures, 8:00AM to 3:30PM, of E52nd Street are expected. This work will be supported by Bayonne Police. 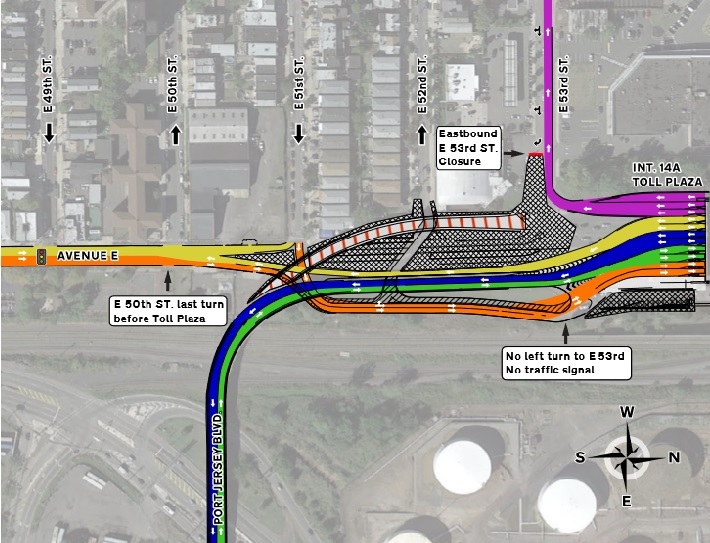 Northbound Avenue E traffic has been shifted to a new alignment, east of the Connector Bridge, between E50th Street and the Toll Plaza. The left turn at 53rd Street is no longer available. Traffic from Port Jersey Boulevard to the Turnpike cannot make a right turn onto the service road at 53rd Street. This is a major traffic shift. Bridge demolition work over Avenue E will begin the week of 11/09/15 between E51st Street and E53rd Street. This work will also be supported by Bayonne Police as needed. CLICK HERE FOR PAMPHLET. A two-way traffic pattern will be implemented on the bridge ramp from Port Jersey Boulevard to the Toll Plaza beginning 11/09/15. Pedestrian usage of the bridge for access to and from Port Jersey Boulevard continues to be prohibited.